During the spring, it is best to dress warmly on the river, and most outfitters require a wetsuit. Make sure to wear non-cotton, synthetic or wool clothing to keep warm. Last minute purchases for camping and river gear can be made either in Mariposa or in Yosemite National Park. Blue Heron Sports – Camping and fishing equipment. Located on Hwy 140 in Mariposa. (209) 742-2300. Yosemite Mountain Shop – Backpacks, carabiners, tents, sleeping bags, and loads of technical outdoor gear are available. 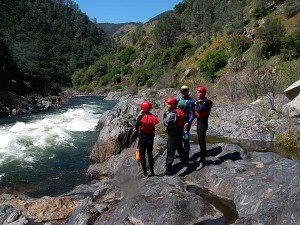 While the gear is not whitewater specific, they have a wide variety of outdoor clothing. Located in the Yosemite Village Store. (209) 372-8396. Village Sports Shop – Another option for outdoor clothing and equipment. Located adjacent to the Yosemite Village Store. Helmets – wear one, and probably a wetsuit too. The Merced is next to Highway 140 and in many places the rapids push up against human-blasted rock walls. They are sharp, and it’s good to be wearing an extra layer and head protection just in case.